The animals infected with an ncp virus between around days 40 to 120 of gestation remain infected and do not develop any neutralizing or non-neutralizing antibodies. The reason for this lack of immune response lies in the stage of maturity of the immune system at the time of infection. In this phase of gestation the body’s own as well as “non-self” antigens are tolerated. The virus antigens will not be recognized as non-self antigens at a later stage because they are present in the critical phase. It was shown that this immunotolerance is highly specific: immunotolerant animals, upon infection with a sufficiently different type of BVD/MD virus, develop an immune response against that virus without, however, being protected against their “own” virus. I.e. the immune system is capable of differentiating between sufficiently distinct types of virus. 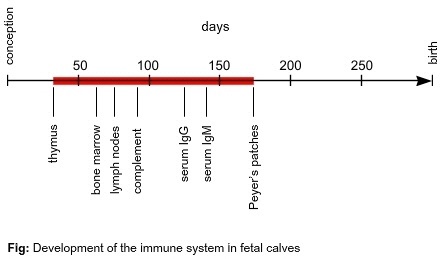 This circumstance is relevant to the question of active immunization against BVD/MD (efficacy of vaccines). The immunization of immunotolerant animals is useless as persistent infection will not be touched.